A material defines how a surface reflects light. A material has two components: an emissive property (background color) and a specular property (reflected light), whose brightness is determined by a power setting. 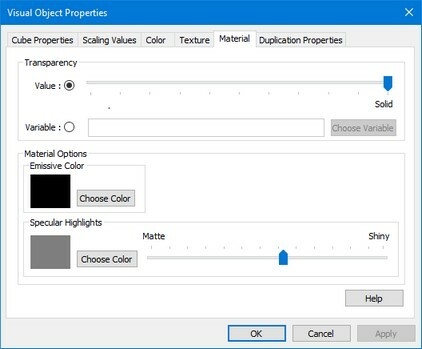 Using the Material tab you can set these options. Choose the transparency of the material by either setting it to a fixed value, or connecting it to a variable which varies between solid (1) and transparent (0). The emissive color is the background color of the object. If you choose the color white the object looks like a light bulb. If you choose the color black to object does not radiate any background color. The value of the power determines the sharpness of the reflected highlights, with a value of 5 giving a metallic appearance and higher values giving a more plastic appearance.